Built between 1860 and 1870, as a speculation intended for a middle class market. In the 1871 census, a general practitioner, a young ladies seminary, an inspector for the Holyhead Road, and a lodging house keeper were listed as resident in the terrace, and commercial directories of the period 1870-80 gave the epithet 'gentry' to several of its residents. Rusticated coursed and squared rubble with freestone dressings and slate roof with stone axial stacks with decorated caps. 2 storeys, the whole is a 17-window range, forming a balanced composition arranged 1-3-10-3-1. The advanced outer 3-window ranges each have central entrance flanked by canted bay windows to ground floor, and a similar rhythm is maintained across the main part of the terrace. The doors have overlights, and entablature hoods carried on brackets, the bay windows (with 4-pane sashes) have slate roofs. Upper windows are 4-pane sashes with continuous sill band and impost band, with decoration to the lintels cut into it. Recessed outermost bays have 4-panelled doors and 4-pane sash windows in projecting lower storey, the windows with entablature hoods. Decorative ironwork balustrade to flat roof. Below the ground floor, there is an archway through to the rear in the right hand, a similar feature blocked to the left. The front gardens throughout are enclosed by decorative cast iron railings on low stone plinth walls. 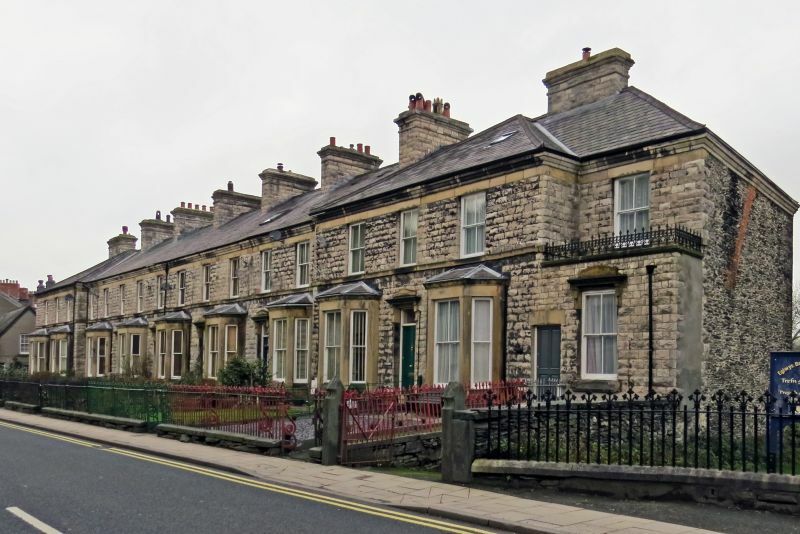 Listed as an exceptionally well-preserved example of a terrace of middle-class housing of c1870. The design is of particular note for its strong overall architectural composition, and for the quality of the detailing.